The plants of the Genus Phalaenopsis are characterised by their rich and easy flowering. 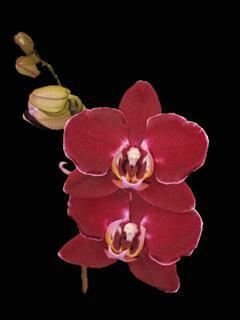 Flowering time: Phalaenopsis flowering generally in spring and autumn, but can be a complete year in flowering stand. The flowering time can vary from 6 weeks up to 12 or 14 weeks. After flowering, snip off the flower stem. The plant must be repot in special orchid ground. This ground exists from for example bark or coconut fibre and prevents that the ground becomes too compact. Put The plant then at warm place and look well after. Afterwards the plant has to energy a new form flower branch. Light: Phalaenopsis need a lot of light, but can never stand in the full sun. Water gives: The plant needs water one time a week. It is important to check if the plant needs water. The ground can be never too dry or too wet. The water also cannot stand still in the heart of the plant. Feeding: One time a month give the orchid an special feeding. Use a normal plant manure, half of the declared quantity uses.